Spain is a perennially popular destination for travellers from across the globe, with its wonderful combination of mountains, beaches, unique culture, delicious food and wine, colourful festivals and open and welcoming people. Whether you want to spend a long weekend in incredible Barcelona with all of its wonderfully eccentric Gaudi accents, take two weeks in one of Ibiza’s beautiful designer villas, or take a car and drive across the Picos de Europa with its stunning scenery, stopping off at local villages and staying in the rustic fonda for some hearty food, or Cangas de Onis for its busy Sunday market – there is a lot to do in this sizeable country. With a population under 50million, it is a relatively uncrowded country, many of the points of interest lay on or near Spain’s lengthy coast, such as San Sebastian, Bilbao, Valencia, Granda and Seville. But there is plenty to see and do in the centre, especially for those more interested in culture and who like their food. The fabulous museums of Madrid are enough to entice even the most resistant art appreciator, while the food in Toledo – also known as Spain’s gastronomic capital – is enough to tempt anyone to make the relatively small detour from Madrid. It also boasts a wonderful combination of Arab, Jewish and Christian monuments. For the wine lovers, visit the Rioja region in northern Spain, with the Cantabrian Mountains forming a wonderful backdrop. Visit the vineyards in the Ebro Valley near Haro, and if you’re lucky (!) get involved in the very messy Batalla de Vino (literally wine battle), part of the summer wine festival. Or why not venture south to Jerez de La Frontera where sherry comes from. 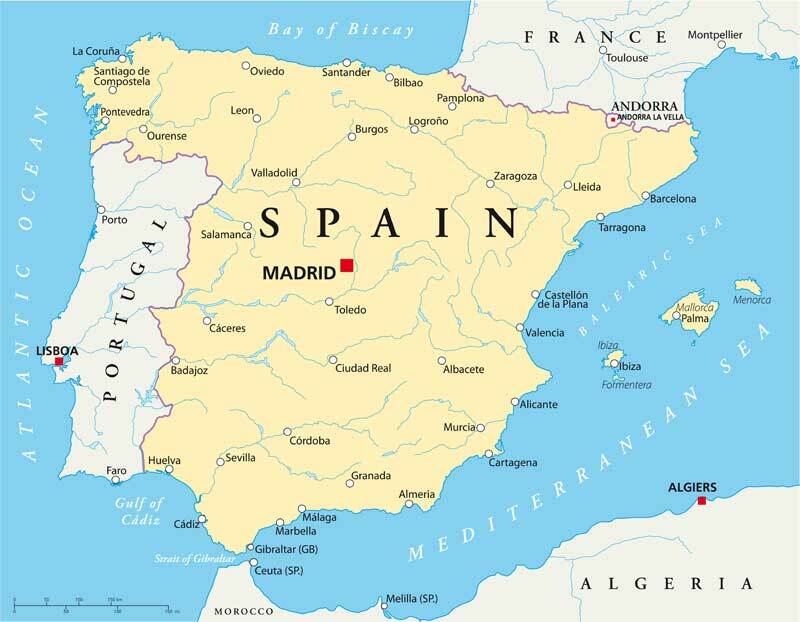 To be called sherry, it has to come from a small triangle of land in the province of Cadiz. In September every year, the sherry festival takes place to celebrate the grape harvest. A three-week extravaganza involving sherry, horses and flamenco with an abundance of colour and joie de vivre. Visit the bodegas and sample the wide variety of sherry available from the pale delicate Fino to the heavy and sweet Pedro Ximenez. Andalusia in the south boasts an array of particularly Spanish fiestas, such as the Bienal de Flameco which takes place every two years, on the even years, in and around Seville and Jerez. Spain’s most skilled Flamenco dancers can be seen displaying their energetic and expressive dances. While the Feria del Caballo in Jerez, the annual horse fiesta every May, is a real spectacle with superb displays of horsemanship from cowboys, classical dressage to polo and carriage driving. There are lots of parades and plenty of traditional, handsomely decked out riders, with their distinctive dark hats and ladies sitting behind them managing to look elegant with the layers of their flamenco dresses draped across the back of the horses. If sport is your thing, Spain boasts some world class golf courses across the country, some wonderful cycling trails through its mountain ranges, motor cycle racing at the Catalonia Grand Prix, then there is a whole range of water sports, such as sailing, wind surfing and kitesurfing. And if this is all too much for you, there are so many beaches to kick back and relax on – choose from the beaches on the north coast, the Costa Verde with its charming villages and coves set in the verdant nature, the Balearic Islands or the pine grove-lined beaches of the Costa de la Luz.